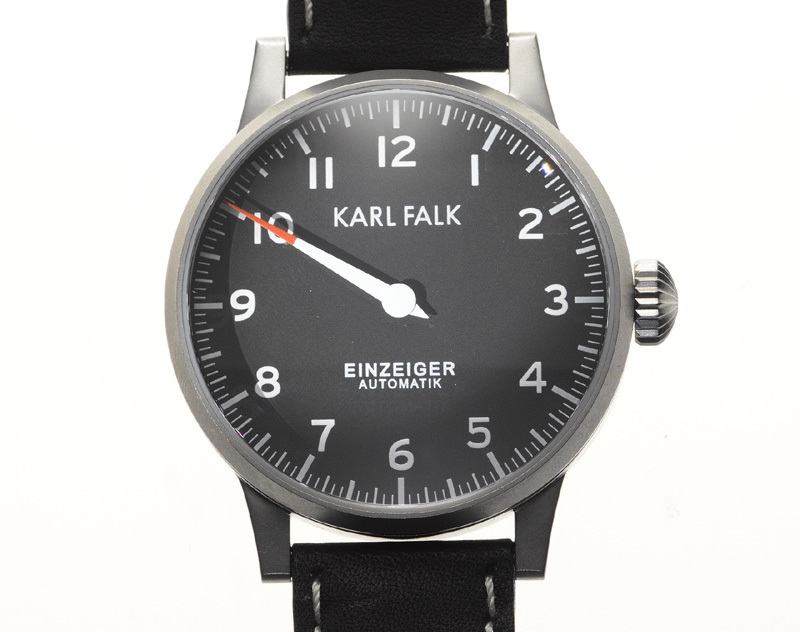 Germany-based Karl Falk sells watches that feature a single hand. There is an online store (Singlehandwatch.com) dedicated to the genre. Karl Falk is featured there alongside another brand like Defakto, but award-winning Meistersinger is missing from the Web site list. Back to Karl Falk. The brand’s name is that of a 19th century watchmaker. Their flagship and only model, the Einzeiger (traduction: one hand), draws inspiration from tower clocks (and car speedometers I would assume) to create a minimalistic watch that displays time by 5 minutes increments. The single hand dial is a poetic call to drop the stressfull to-the-minute accuracy in favor of a more laid-back approach of time. In substance, it doen’t provide indication of time to the second, but it still does provide enough information to meet appointments. The Einzeiger uses ETA calibres 2824-2 and 6498. Prices are aligned to a little bit less than USD 1500, which then leaves the presence of an automatic winding system up to personal choice. Technically I tind it hard to justify since the 2824-2 is know to be more expensive than the 6498. Anyway, the watch comes in a nice packaging which includes a change of bracelet and strap, a tool kit for swapping the strap and adjusting the bracelet, and a nice catalog.